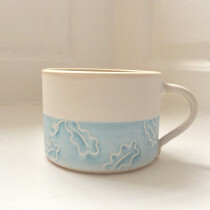 Sue Ure produces her contemporary hand-made ceramics in her studio in south-west France. Her collection of tableware and vases are characterized by her pared-down clear shapes and subtle colour palette. She also works to specific design briefs, for Tate Enterprises creating pieces for their major Matisse exhibition and recently for the William Morris Gallery; a commission which has inspired a whole new collection “Nature”. She has also supplied collections for The Royal Academy's Richard Diebenkorn exhibition, for the Royal Maritime Museums Greenwich and for Tate Britain's Barbara Hepworth show. 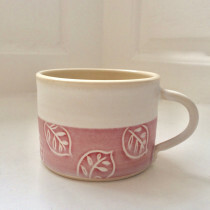 Every piece is hand-thrown, all the glazes and slips are developed in Sue’s workshop and every piece is created with care and attention. Series are produced in limited numbers and new collections are constantly being developed. 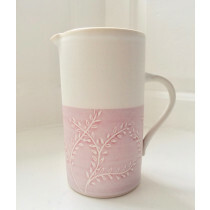 Ceramicist Sue Ure moved to south west France in 1994, where she continues to work in rural bliss. 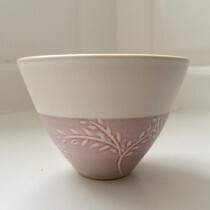 Her ceramics are characterized by delicate shapes and the soft, slightly washed-out colours she achieves through careful mixing of glazing ingredients. Pottery has fascinated me since my teens. I love the tactile sensation of throwing, and the feeling that you're creating something from virtually nothing. You're making something functional that can be used and enjoyed every day, and that can have extraordinary longevity. Shape rather than pattern has always preoccupied me and influences on my work have been diverse; from the Finnish brand “Arabia” tableware I grew up with, to Minoan pottery. 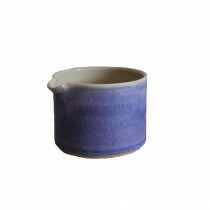 To hold a hand-made pot is to have an instant connection with the hands that made it. And when those hands were working 4,000 years ago, it’s an extraordinary sensation. Once I have the shapes in mind for the pieces I want to make, I mix different types of clay together by hand, including recycled clay. This is remnants from a previous batch of work - I think the term in industry is pre-consumer recycled content. You need the right consistency of clay for the size of the piece you’re making, which is why I mix clays by hand. I throw on to marine plywood batts, which sit on the wheel and make it easy to lift up the thrown pot. I’m just having to replace the ones that are 30 years old. Generally I’m pleased my equipment has had a long life. I have two electric wheels, my original one has been refurbished and I bought another one, not realizing the original would be so successfully re-vamped. I’m about to take delivery of the third kiln of my professional life and I’m expecting it to see out my career. Apart from these large items, my tools are amazingly basic: natural and vegetable sponges, tiny strips of chamois leather, small bits of wood and bamboo for smoothing and removing excess slurry, and little strip metal tools for turning, the process that comes after throwing. This is when a pot is returned to the wheel after it’s dried off enough to be held without deforming it, and excess clay is trimmed off and it’s shape defined. If handles are to be applied, it’s at this stage. The pots have to dry out before being what’s called biscuit-fired. This firing, which I make last about eight hours, goes to 1000°C. My kiln is electric: it has no chimney, so all the heat is kept within its well-insulated walls. Pots take about 20 hours to cool down after a biscuit-firing. Glazing happens next and that’s when you give the pots their colour. Glaze is essentially a combination of silica and alumina plus fluxing materials, since by themselves neither of the core ingredients would melt at normal glaze-firing temperatures. I make all my own glazes. The basic raw materials are mostly innocuous - mainly ground rock of one sort or another. Then there are other materials, which are potentially more dangerous, but used in much smaller quantities. They could be dangerous before firing if you’re careless, but once fired, they no long present a risk. In terms of the mechanics of glazing, I mix powdered glaze ingredients with water and sieve the liquid. The resulting glaze has to be stirred immediately before the pot is dipped in it, otherwise the powders sink, which means that not enough glaze material goes onto the pot. The pots are very porous, much as terracotta flower pots are, and the water content of the glaze is very rapidly absorbed, leaving them covered with a fine layer of powder. Almost every piece of pottery I make has a different glaze inside and out. Mostly I’ll start with all the insides, so I pour the glaze into the pot, swish it around in one movement and empty it. I'll do the outside the next day..you have to hold the piece iso there's no trace of finger marks. You have to do this deftly and rapidly - too long in the glaze and the application will be too thick. If there are any gaps, these have to be corrected with a glaze-laden brush. Glazed pieces are then placed in the kiln for 8-9 hours, which is heated to1260°C. I have to pack the pots carefully to avoid colour disasters… some glazes have volatile oxides, and one of my copper-rich glazes will give a distinct green blush to any pot close to it. 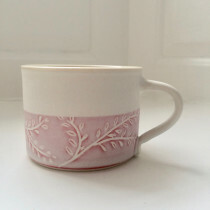 Glazing is a hugely messy process, and spills are inevitable but when the pots are in for the glaze-firing, it’s the ideal moment to put the workshop in order, before taking the new finished pieces out of the kiln and starting the making cycle all over again. How eco do I think I am? I make around 1,500 pieces of pottery a year, and I feel comfortable about what I do from an environmental point of view. I’m confident I’m not a guzzler of scarce resources – I haven’t heard of protests around clay or mineral quarries - nor do I pollute the atmosphere. Kilns require a lot of heat, but are efficient at keeping it inside. As the temperature rises gradually, the kiln is not on full power for the whole length of the firing cycle. Most potters also maximize efficiency by making sure their kilns are absolutely full. I also love the fact that what I make will usually have a long life, since it won’t degrade over time. And even if my pieces do get dropped and broken into little pieces, they can be recycled, or simply put back into the ground, since china is inert. They’ll become part of the puzzle for the archaeologists of the future.